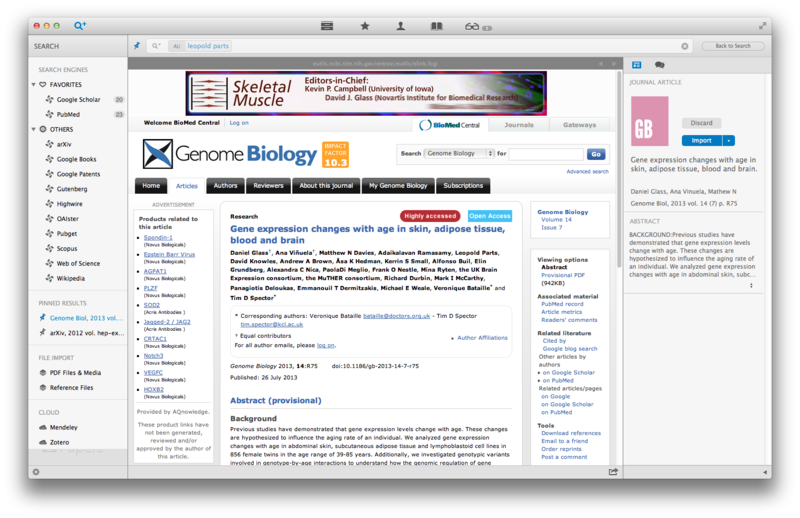 Use any of the 25+ built-in search engines to find literature in your field of research. 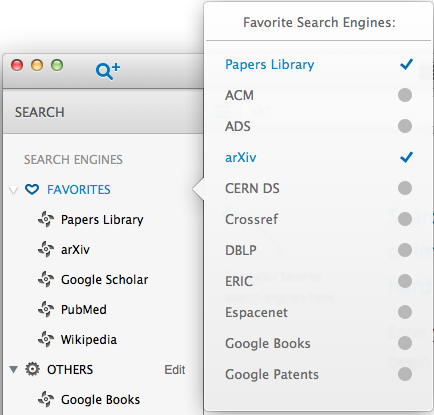 From PubMed, Scopus, to ArXiv, and Google Patents, a full range of options are available. 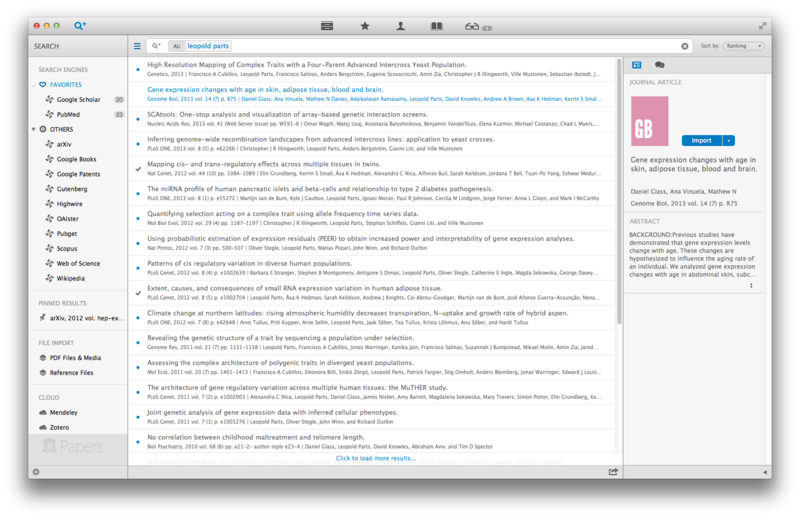 Papers 3 for Mac now also shows you suggested articles based on what you are reading, and helps you discover content published by authors in your field. Tap on the search loop icon to enter the search mode in Papers. Bring your cursor over Favorites and select from the list of search repositories that you want to include as your favorites. 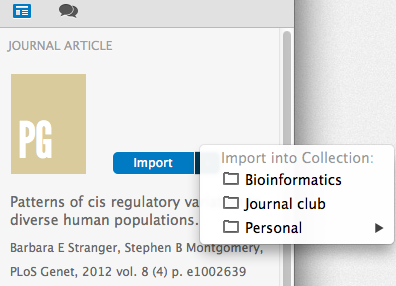 In a similar way you can add repositories that you only use occasionally to your Others folder. 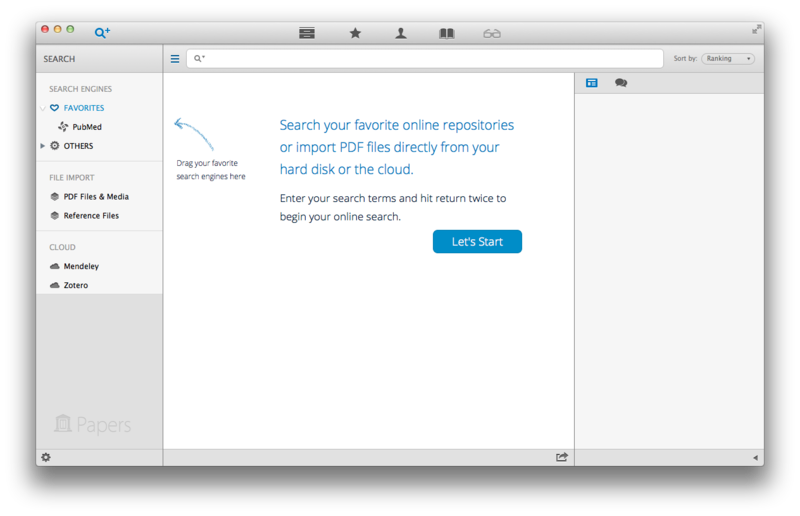 You can also drag repositories from Others to Favorites and vice versa. 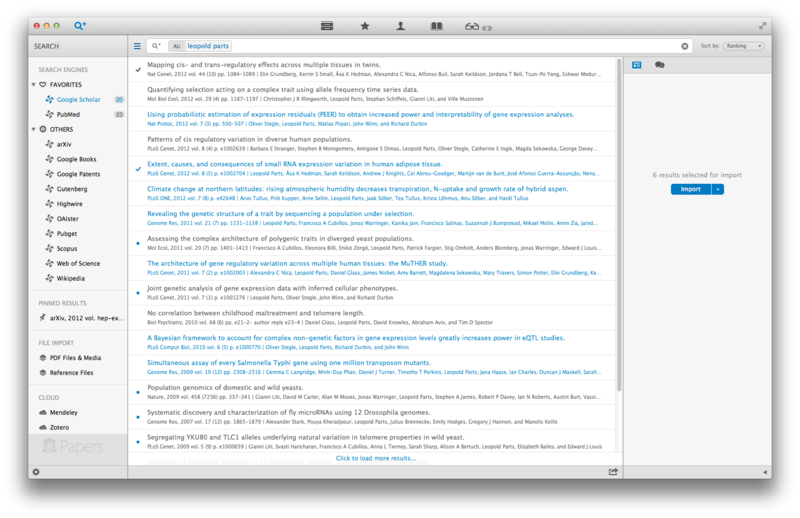 When you do a search in Papers, it searches in all your favorite repositories at the same time by default. Click on a specific search engine in your Favorites or Others to show search results from a selected repository. When you type in your search term it is applied to all the possible metadata fields available such as authors, titles, abstract, source etc. When you start typing your search term, a pop over of different search tokens is displayed. Select a search token from the pop over window to specify your search. Here you can see how search results are displayed under the search window. 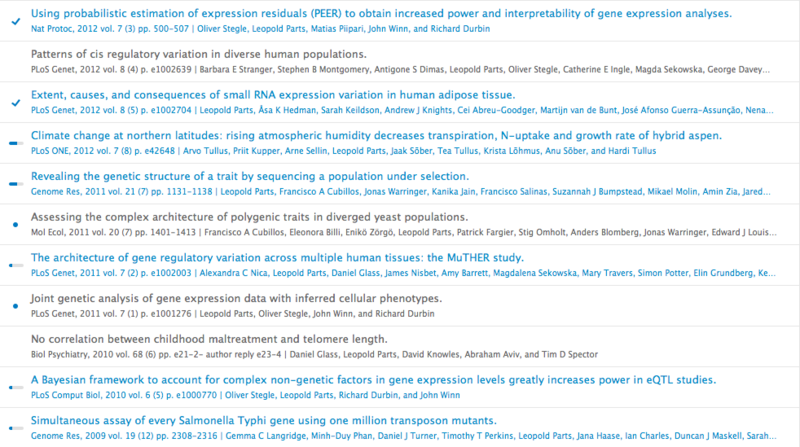 The blue dots indicate new publications and the tick marks mean that you already have those publication in your library. Double-click or open a paper from the list of search results and it is automatically pinned in the sourcelist until you are ready to either import or discard them. 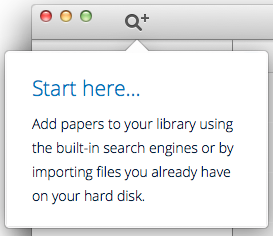 To import a paper, click on the Import button. If you are importing a pinned search result, it is automatically opened in the reader mode. 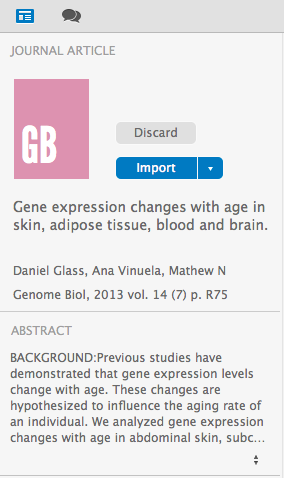 If you have access to the full-text article Papers tries to automatically download the full PDF to your library. You can also import search results directly without pinning them. Click on the arrow next to the Import button to import a search result directly to a collection. Batch import a selection of search results. Press down cmd key and click on the search results you want to import. Once you have selected all the papers that you want to import press Import and all the search results are downloaded to your library. 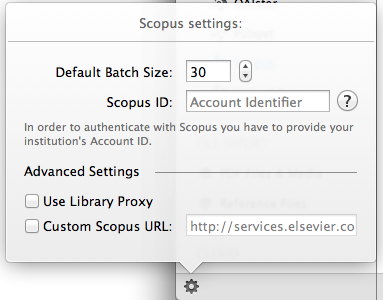 If you use a search engine that might require extra settings such as an institutional account ID in case of Scopus or custom Web of Science URL, select the search repository from Others/Favorites and click on the Settings gear to add extra settings.